Hi friends! I am so excited for today's post. Heather from The Elementary Journey and I are teaming up for a mini book study on Word Nerds: Teaching All Students to Learn and Love Vocabulary . I always try and read a few professional development books over the summer, and so far I haven't made it pass Word Nerds. There are SO many great ideas in this one that I really wanted to take my time and soak up all of the info it has to offer. As I was reading, I really thought about how I have been teaching vocabulary in my classroom and I realized something: I really wasn't teaching vocabulary like I should be. Isn't that pen adorable?! It comes with two others that are even cuter! You can grab them here . When I read this part in the introduction, I thought "exactly!" I hate to admit it, but that's what I had been doing. I gave my kids the vocabulary words, we would have an activity to practice them, and then we would test Friday. And guess what, after Friday's test, we never talked about 90% of those words. Sure, I left them posted in the room after the test, but we never actually used them in context or practiced them. Did my kids retain those words? Nope. I blamed this failure on time. 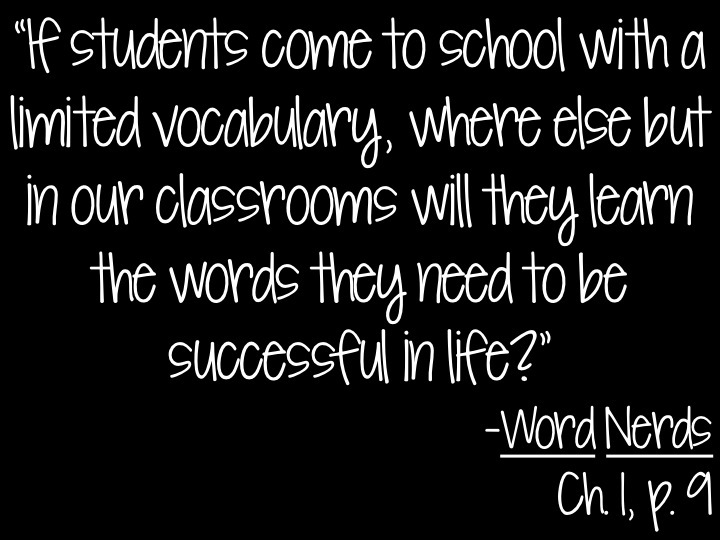 There simply isn't enough time to spend on vocabulary and effectively teach it. Or that's what I thought until I read this book. I was wrong. You can (and should!) 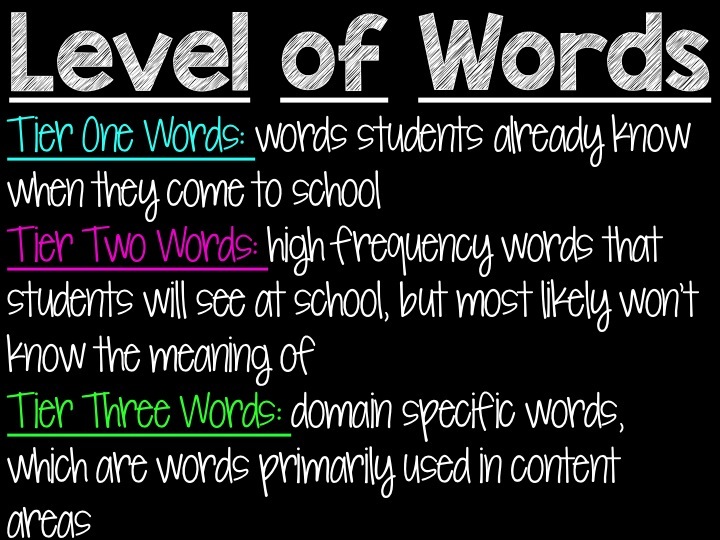 spend a good amount of time increasing your students' vocabulary! I was so focused on getting everything in by Friday in time to test on it, that I was missing the point of the content. I found myself teaching the best when I slowed down and provided students with enough time to practice with content. The book follows two teachers- Leslie H. Montgomery and Margot Holmes Smith, a 3rd and 5th grade teacher. It shows ways the two teachers teach and practice effective vocabulary strategies in their classrooms. The one thing I wish the book had done differently is put the Vocabulary Cycle Plan (found in Ch. 8, p. 124-125) in the beginning of the book. I found myself thinking a lot throughout the book "Okay, that's a great idea, but when am I going to fit that in?? There isn't time to fit in that much vocabulary instruction!" They include both a 5 day Vocabulary Cycle Plan and a 10 day Vocabulary Cycle Plan and after thinking and planning, I've found that a 10 day cycle will work better for me. At first I was worried that my kids wouldn't be exposed to enough words if I did 10 days (2 weeks) at a time, but when you read the book, you realize that while there are only 5 or 6 vocabulary words at a time in the cycle, you are also learning and practicing synonyms and antonyms for each word. I sometimes need to see the end result or what something will look like on a bigger scale before I work or understand the smaller parts, so having that in mind at the beginning of the book would have prevented me from wondering what the plan would actually look like on a day to day (or week to week) basis in my classroom. 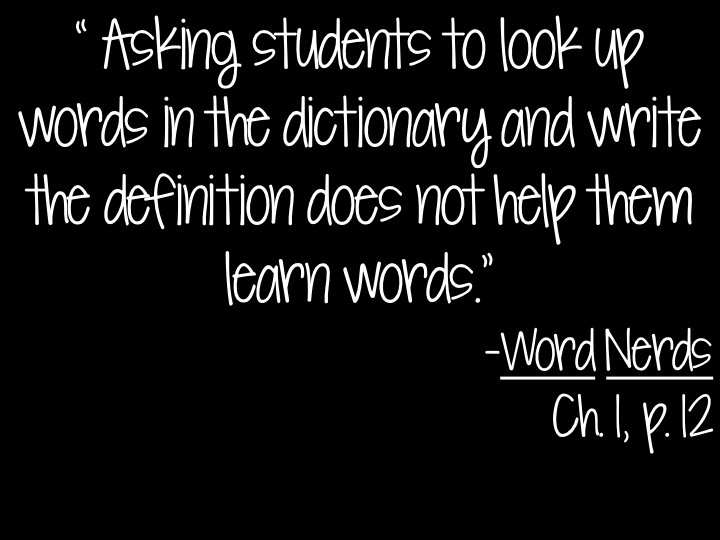 Chapter One is titled What's the Big Deal About Vocabulary Instruction? This sentence from chapter 1 really stuck out to me. WE are responsible for exposing kids to new words in order to provide them with a chance at a bright future. This is important, people! Chapter 1 also discusses the level of words. My wonderful instruction coach first taught me about this, so I was glad to see it mentioned in this book. Levels of words was created by Isabel Beck, Margaret McKeown, and Kinda Kucan in a book called Bringing Words to Life. I think I've always known this, but still. Knowing and taking action are two different things and I blamed time again. Sure, I did a few activities like Quick Draws and Vocabulary Review, but I wasn't providing daily practice in order for kids to retain new words. So what was the big point I took away from the Introduction and Chapter 1 of Word Nerds? Are you reading Word Nerds? Or have you already read this amazing book? We would love for you to share your thoughts with us as we post ours! Comment below and tell us what you are thinking about providing vocabulary practice and effective instruction in your classroom! I just finished this book and it was a huge eye-opener for me, too! It made mr realize my vocabulary instruction really has fallen short in the past, and I'm definitely going to step it up this next year. I look forward to following along with your book study! I just finished this book a couple days ago. I loved it! I like how it told me what was wrong with vocabulary instruction and how to fix it. I also liked the continued relationship with common core and assessments. I loved the examples of activities too. I bought my land yards and am thinking of ways to implement it next school year! We have done tiered words in my own county for quite some time. We are expected to have them posted in our classroom and labeled Tier 2 and Tier 3. I thoroughly go over the words, what they mean and how they may mean different things in different subjects. My 1st graders could tell me what distinguished means and observe and communicate. It's a cycle and a process but so worth it when you know they those these big words and what they mean. I have FINALLY opened my book today and read chapter one. Funny how we are on the same wavelength...knowing we need to do more, but finding the time and resources are limited. I am going to be strategic about vocabulary teaching this year! We have to start somewhere!! LOVE your blog, btw!! I just started reading it and am trying to catch up to you ladies. I didn't realize how much I NEEDED this book until I started. So excited to follow along with you book study! I'm a kindergarten teacher moving up to 5th this year. My book just came today after I read your first few reviews. Trying to get caught up. Just finished Chapter 1 and I'm already feeling connected to the text!